In a few short days we’ll honor Dr. Martin Luther King, Jr.’s work and memory by observing a holiday; in a few short weeks, we’ll begin a month-long celebration of Black History and the incredible men and women that have impacted our nation and continue to do so. I’m writing to urge you to leave the eggs at home. You know the ones: one white egg to represent white America, and a brown egg to represent MLK/Black America/non-white America. Students make predictions, you crack the eggs, and a few minutes later racism is eradicated in a generation because they see that yes, on the inside, they’re both the same. Please don’t stop reading just yet. You might be angry or disagree, or think I’m making a mountain out of two sets of eggshells, but hear me out. If you still disagree at the end, you have my permission to leave me an angry comment – I just ask that you make it to the end! To conduct the experiment, you’re relying on students seeing the white egg – whether you explicitly ask them to associate it with white Americans or not – as the default. The normal egg. The good egg. The egg you’d eat. You’re also relying on students seeing the brown egg – whether you explicitly ask them to associate it with MLK, Black Americans, or non-white Americans or not – as the other. The different egg. The egg you’re not so sure you want in your omelette. The only way to get to the shock factor, the “Aha!” is through the route of one being more desirable than the other. When you crack them and students find that the brown egg is the same on the inside as the white egg, there’s your “Aha!” Because in spite of it being brown – in spite of its differences, its “otherness” – that brown egg is just like the white one. Because the white one… the white one is normal. The subtle message this sends is that Black Americans are the same and just as good as white Americans – in spite of the fact their skin is different. That we measure and value things against one single norm, one default. That message is one that I don’t feel we can risk sending to any of our children – especially not out of the convenience of teaching a message of racial equityin a neat, tied-up, twenty minute lesson. 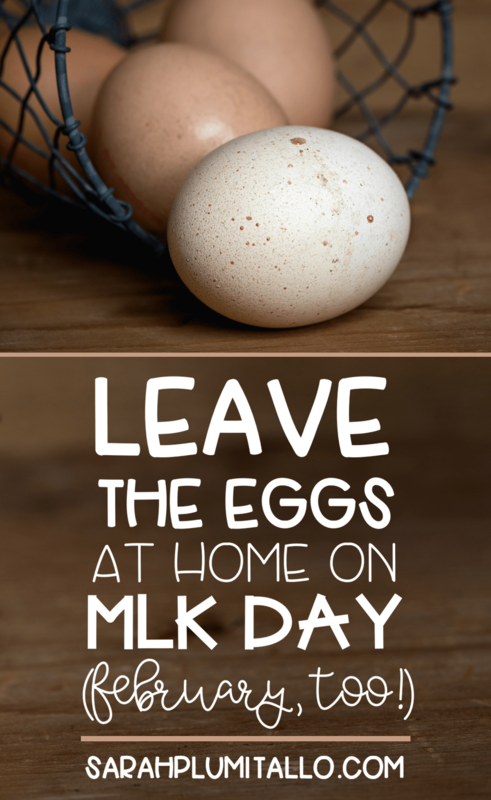 So you leave the eggs home on MLK Day (and the whole month of February). Now what? Start with the students – as individuals. Complete a “Find Someone Who” activity that highlights the many perspectives, cultures, and backgrounds within your own student population and classroom. Students may find out they have more in common with their classmates than they knew, or have an opportunity to get to know their classmates in an engaging, low-stress way. Afterwards, have a discussion centered around the idea that because of (NOT in spite of) their varied backgrounds and experiences you have a wonderful classroom community! Focus on the future to honor the past. While I’d urge you to consider teaching beyond the “I Have a Dream” speech, I recognize this is where most educators start their journey in teaching the Civil Rights Movement and Dr. King (hear more about this topic on Episode 5 of Equi-TEA). Before listening to or discussing Dr. King’s famous “I Have a Dream” speech, have students record (anonymously) their hopes for their own lives and for our country for the remainder of the school year. Place them all in a jar and then read each aloud. Have students respond silently with a thumbs up to indicate agreement or with their fingers inter-locked to make a connection. After you’ve read all the responses, identify a common hope that you can create a goal around work toward. Next, listen to Dr. King’s speech. Help students to draw parallels between Dr. King’s efforts to form partnerships to see his dreams through. Conclude by talking about ways your classroom community can work together to reach their shared goals. Examining the impact of our actions despite the best intentions isn’t easy – I often find myself feeling conflicted about my own work as an educator as a result. But it is, after all, the impact that matters most. It can be the only thing that matters when we think about our students and their future. Thank you, Sarah for pushing our thinking. It is so easy to compare without us thinking that we are. I’m hoping to honor Martin Luther King’s work by honoring others who have also worked towards equity; past or present. This is a great time to launch biographies and I have been purposefully selecting texts of varied individuals who have made an impact. I agree with this also. I have only ever eaten brown farm eggs so the idea the white is the norm never occurred to me because to me it isn’t! Isn’t it interesting how personal schema and perspective plays a part. Every year when I do this I get a white egg from a teammate and give her a brown and I talk about that to the kids too. I also start the lesson handing out skittles to some kids (think the brown eyed blue eyed experiment) so I think this lesson can still be taught as long as we are aware of biases. I feel like it’s the most concrete way for children. That’s what I came here to say. The majority of people around here eat brown eggs because of farming. To my students the white egg would be different even though my whole class is white this year. My own children have only eaten brown eggs most of their lives so I don’t think they would necessarily see a white egg as better? I do understand your point though! I teach kinder, so it can be a hard concept for my kiddos to grasp that despite differences on the outside, we are all the same on the inside – hence the egg visualization. That being said, I will have to think about if this is the best way to show my students this from now on! Where I live brown eggs are the most popular and sought after. I still will use the egg example with my kindergarten students. I read that another teacher was using M&Ms. Same lesson. Same concept. It seems to cover all color versus lumping color into two categories and if students see white eggs as preferable (here in rural TN where many families have chickens at home) then that is resolved in a sense. I’ve also seen this lesson done with apples. If you cut the apple through the middle, the seeds make a star, which is a nice image. However, I think that with Sarah’s lessons, the main take-away is exploring the many similarities and differences among the individuals in our classes. Appreciating the things that make us unique will have a lasting impact in our students’ lives. Sarah – thank you for these ideas! I’m looking forward to trying them out with my class. Respect your thoughts, although like others above, brown eggs are the norm, better. Feel that it is more of a how you deliver it issue. I also use & like the M & M’s example. I totally understand where you’re coming from, however I don’t necessarily agree. I think the point is that the eggs look different, not that one is “better” than the other. Kids eat the eggs you give them. I don’t think they understand/know or care if a white or brown egg is better. Just reading the comments above, most people go after brown eggs anyway. I think it would be the same thing as cracking open two M&M’s. They’re red or green – but they look the same on the inside. One isn’t better than the other, they just look different on the outside. Thank you for writing this. I think it’s well-intentioned, but like you wrote, it’s the impact that matters. I think of kids of color having to watch the other students examine the inside of the eggs to see if they’re the same or not and just cringe. No one should be made to feel like that. I found this very interesting. I think it depends on where you come from whether white eggs are viewed as “normal” or “better.” I just saw this lesson as presenting them as different, but for example my mom would never but white eggs, so I definitely did not have a preconceived notion of white eggs as normal and brown eggs as weird. And, as another example, my husband, who comes from France, was thoroughly weirded out and disgusted by white eggs when he came to the US for the first time 6 years ago. He had literally never seen a white egg before. So I don’t think one can necessarily assume that students would view the white egg as the norm and the brown egg as deviating from that norm. I certainly think it’s something to consider before planning this lesson in your classroom, in case that might be the case in the classroom where to teach, but I do not think it is an inherent problem in the lesson, which in my opinion presents two eggs that look different on the outside but does not necessarily present one as normal. I would just say thanks for the heads up that this perception is one possibility, so teachers can take that into account as a possible reason not to do this lesson with a particular group who might see the eggs in that way, due to a lack of exposure to the variety of colors eggs can be. I really don’t get the point that the article is trying to get across. Huh? How are white eggs seen as better? Brown eggs are very common. This is definitely stretch. I think the M & M’s are a good option as well. I do see where you are coming from, but each year, I do this activity but I use dyed eggs instead. Blue, green, purple, yellow, orange, red, and even grey. I also never bought white eggs until I was a teacher in my 30’s. All of our eggs came from a local farm and were brown, blue-ish, green-ish, speckled, etc. I brought this article up with my 3rd/4th graders before doing the lesson and this was their feedback. Instead of coming up with a rant about how intelligent and convoluted we can make something like the poor egg, ask your students what they think – Luckily, children are incredibly observant and honest. Here’s what my 128 kids had to say: 1) people aren’t actually eggs – it’s just a method to deliver a point, 2) no egg color is “superior”, and why would someone even think that anyone else would believe that?, 3) this would make everything worse if we thought of only a certain kind of cheese, bread, meat, cookie, etc as being superior (poor vanilla & chocolate ice cream! ), 4) why can’t people like what they like without being judged and made to feel bad?, 5) why do we always have to force a bad feeling into something like an egg when it helps us see the similarities inside?, 6) all eggs and their insides are actually different – I might have freckles or a scar and my heart or stomach might be big or small. That should be ok., 7) why can’t adults be more kind and love our differences without grading us? There were many, many more things these kids said and as far as my students go, white/Caucasian is the minority (13%) and what was really interesting (to me) was that almost 96% of kids eat white eggs. One of my students said they are “really cheap”. Over 85% of our kids are reduced lunch. So then the conversation veered towards how “rare” and “special” the colored eggs are compared to the “cheap” and “common” white eggs. This POV was a failure with my students. But I can see how as adults we take something from our own POV or turn our own feelings into a “lesson” that just isn’t valid for many others. When in doubt, ask your kids what they think of adult “lessons”. Also, after we did the experiment, my students were like: Are you just WASTING those eggs?! (My Messengers brought them to the lunch room). Maybe M&Ms would be “better” but they’re banned due to food allergies. ???????????????? Amazing job getting student’s perspective on the lesson. I’m surprised so many commenters don’t seem to get the egg message. I love brown eggs, but I was raised thinking white eggs are preferable. Even if brown eggs are more sought after, the message is still off. Why even bother going there? Why not just try something new? I can absolutely see some of my students picking up on subtle messages with that. I don’t have black students this year, but I have many Asian students with darker skin. They’re only in third grade, but they’re sharp. We’re going to talk about experiencing racism on Tuesday, though it’s not the first time we have discussed this stuff. I love these ideas and can’t wait to talk about this stuff in my class. Thanks for pushing us to be better! I was really hoping to be blown away by this post. I love following you. While I think I understand completely your assertion (In order for this lesson to actually be successful, students may compartmentalize that the white egg is better) However, I think it misses the mark on why this egg lesson actually should be left at home. The lesson teaches that while outer shells may be different, when cracked open a goopy yolk exists. TA-DA… we are all the same. *Insert ALL the negative-albeit unintended- narratives we feed children about color blindness. * Unless you are literally teaching kids that anatomically we all have the same organs, units of blood, arteries… we are NOT the same. You want an “aha” moment? Crack open eggs with all different insides. Now we are talking!!! Your kids will EXPECT sameness but be greeted with just how different we all are!! I hope we can all start teaching our students about color consciousness and stop perpetuating this notion that we are all the same in the inside. I think this lesson is still valuable and shows kids in a concrete way how you don’t judge someone on the outside. I am the mother of two bi-racial children and a first grade teacher They have been raised to see the best in both cultures they are a part. They are 16 and 18 and to be honest their generation is very comfortable with their race. I have to admit, I’m one of those teachers who used the eggs, but after reading this piece….. never again. However, the other ideas suggested only work for older students. What ideas can you share to use with prek, k and 1st grade? Thank you for educating this educator! The color of eggs, the color of m&ms — I don’t think that’s really the point that Sarah is trying to make. I think the point is we are valuable BECAUSE of our differences, not IN SPITE of them. And that’s a hard point to make whether you are cracking open eggs or sucking the color off m&ms. It’s the salad bowl vs. melting pot point. When we talk about differences we divide, when we talk about similarities we join together. Why would any teacher teach the white eggs as better or normal? To me, they are just 2 eggs that look different on the outside. It doesn’t even have to be related to color if you don’t want it to be. I think this mode of thinking creates an overly offended society. 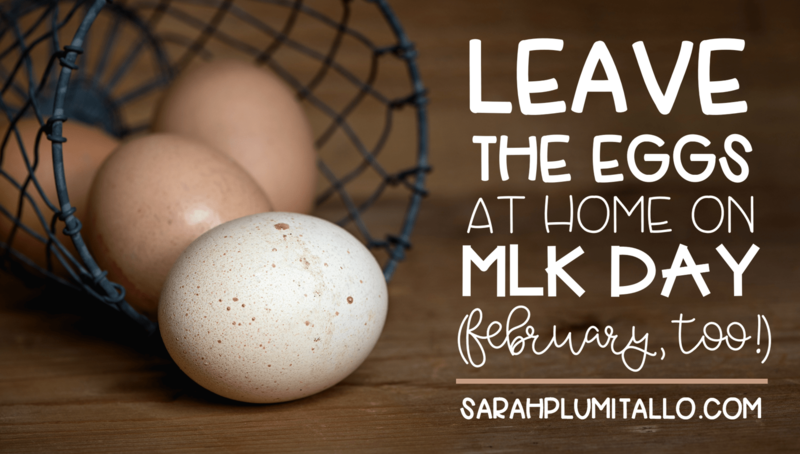 I have to admit that I had never heard of this lesson until a week ago when a friend told me her grade level partner wanted to do this for MLK. My initial response was confusion and I was bothered that this was somehow supposed to suffice to teach about Martin Luther King Jr and his message. Please don’t be offended if you teach this lesson, but I’m just telling my initial response. After some thought, I think that comparing race to different colored food is an unsophisticated and superficial way to broach the topic with even the youngest of learners. It seems that a richer way to discuss MLK and his big ideas of peace and equality would be to focus on how we are NOT all the same, that we are all unique inside and out and that regardless of our physical or ideological differences, all people should be treated with kindness and fairness and should be given equal opportunity. So I guess the thing that bothered me initially was that our learners will rise to meet our expectations if we introduce complex ideas to them; that we should treat them like the intelligent human beings that they are and not compare any of them to food. The problem isn’t with the egg lesson. It’s with the teacher that would actually call the white egg the “normal” egg. I think the egg lesson. is a perfect and concrete way of demonstrating that the outsides are different but the insides are th same. Also, it’s ehats on the inside that matters. I respect that our opinions differ on this, but what I’m saying is that the problem actually IS with the egg lesson.